Our devotional courtyard offers a place of quiet and reflection for our parish and for the community. The central feature of this courtyard is a Labyrinth, an ancient spiritual design. It has been used throughout history for prayer and meditation, with a revival of sorts in the early 1990s. The St. Mary Labyrinth shortly after completion. Labyrinths can be traced back 3,500 years, but the Labyrinth at the Cathedral of Chartres in France — the style of our Labyrinth — dates to the 13th century. Throughout history, pilgrims have travelled to holy sites to encounter the sacred and to renew their faith. When the Crusades and the plague made pilgrimage to the Holy Land almost impossible, Labyrinths came into use as a pilgrimage-in-place. Pilgrims could engage in the same kind of prayer journey without leaving their native land. Walking the Labyrinth is the equivalent of four city blocks. The path to the center and the path out are one and the same. The Labyrinth is not a maze or a puzzle. It is simply a path. Take some time to clear your mind, to relax before you walk. Weather permitting, you may wish to remove your shoes. Move at your own pace. Be open to inner promptings to pause, to slow down, to pass others. Do what feels natural. Maintain silence throughout your walk, for your benefit and for the sake of others. As you enter the Labyrinth, you begin the first of three stages of your walk — Purgation. This is a time for releasing, letting go of the details of your life, the cares and concerns that keep you distracted and stressed. As you reach the center, you are open to the stage of Illumination. Stay in the Center as long as you like. Continue to do what feels natural. Sit, kneel, stand, meditate, face several directions. Read something you have brought with you on this journey. Stay in the center for as long as you wish. It is a place for clarity and insight. Receive what is there for you. As you prepare to leave the Labyrinth, take time for gratitude and for integrating this experience into your life. This part of the walk is the path of Union, joining God, bringing back to the world a renewed vision or a refreshed spirit. Each time you walk the Labyrinth, you may become more empowered to find and do the work God as given you. Spend some time outside the Labyrinth in reflection and meditation before you leave. With the challenges and concerns of our busy lives, the Labyrinth offers a way to journey in faith, to find stillness and rest. Labyrinths can be found in churches, parks, retreat centers, hospitals, schools, homes and prisons. One architect notes that the Labyrinth is a "sure path in the changing and uncertain world." 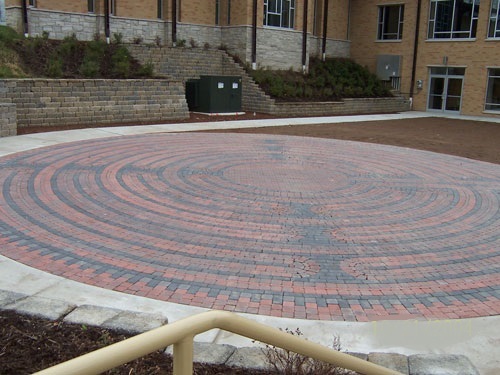 The Labyrinth at St. Mary is made possible through the generous donation of a parish family. Their research about this sacred path convinced them that this would be a valuable contribution to our spiritual journey. You are invited to walk the Labyrinth alone or with a group, at the beginning or end of your day, on your lunch break, as the sun sets, by starlight and moonlight, in all seasons. For more information about the Labyrinth, please contact the Parish Office. to reveal Your path of truth. and justice among your people. faithful to your word revealed among us. our truth and our life.